Treasures To Grow On seeks to assist parents in meeting the needs of their children in the five developmental domains: physical, social, emotional, cognitive and spiritual. 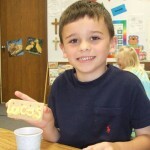 Our programs are Christian in every aspect – Christian principles are woven throughout the school day. Additionally, the school is committed to keeping class sizes small to better meet the developmental needs of each child. The preschool program is a balanced program of developmentally appropriate play and academics. Children are given opportunities for free play and teacher directed play. Academics are presented using a combination of rote learning, and hands on learning. There is a strong emphasis on developing a love for books and for reading. The letters of the alphabet and their sounds are presented along with other school readiness skills such as rhyming, patterning, sequencing, sorting, categorizing, predicting, opposites, shapes, numbers and counting, and listening and following directions. Junior Class (age 2 1/2 by Sept. 1) meets 2 half-days per week – Tuesday and Thursday from 9:30 a.m. to 12 noon Class size is 8-10. Senior Class (age 3 1/2 by Sept. 1) meets 3 half-days per week – Monday, Wednesday and Friday from 9:30 a.m. to 12 noon. Class size is 10-12. 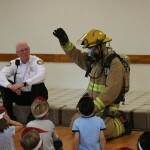 The Beginner-garten class is designed for the slightly older preschooler (older fours/young fives). This class encompasses the entire program described above plus some additional paper and pencil tasks, and a stronger emphasis on phonics and learning to read. If children are ready, they are taught to read blends, one-vowel words, and simple sentences. 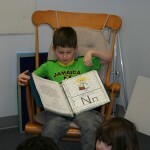 Some children progress to the point of learning two-vowel words and special sounds. Beginner-garten (age 4 1/2 by Sept 1.) meets 4 half-days per week – Monday, Tuesday, Wednesday and Thursday from 9:30 a.m. – noon. Class size is 12-14. Great Start Readiness Program (GSRP) is a FREE preschool class funded by the State of Michigan for eligible children. Please contact the school if you would like more information about GSRP.